As usual, Alphacool uses pure copper for the NexXxoS V.2 radiators. The end chambers, the water channels and the cooling fins are made of copper and are a unique selling point worldwide. 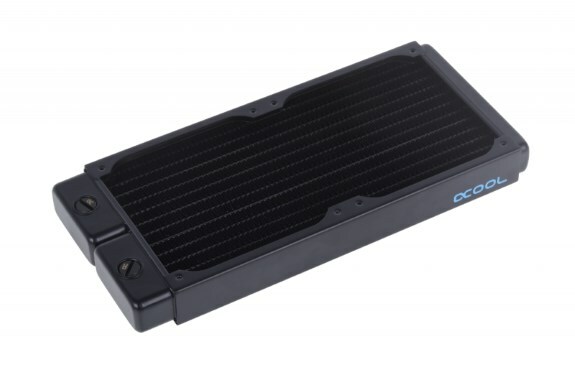 As a result, Alphacool radiators have been among the most popular and best on the market for many years. The perfect foundation for any water cooling system. All NexXxoS V.2 radiators rely on the new patented stop fittings from Alphacool. Anyone who has mounted a radiator on the front or in the ceiling of a housing knows that protruding screw plugs can ruin the aesthetic as the radiator cannot be placed flush. Alphacool offers a solution with the new patented screw plugs. They are fully countersunk in the radiator and sit flush with its surface. This means that nothing stands in the way of clean installation. Of course, the radiators also look much more elegant with the new locking screws. The NexXxoS V.2 radiators are available in all common sizes. From the compact 120 mm ST30 radiator to the 480 mm radiator for those who cannot get enough cooling power. Fans of 140 mm fans won't miss out though as Alphacool also covers all sizes from 140 mm up to the huge 420 mm XT45radiator. And to take the whole thing to extremes, there are ST30 and XT45 versions for all radiators. These differ quite simply by the thickness. ST30 stands for a thickness of 30 mm, XT45 for a thickness of 45 mm. The NexXxoS V.2, like the previous NexXxoS radiators, offers special protection that prevents screws from penetrating the radiator when attaching fans or when mounting the radiator to the case. Protective plates have been placed under all mounting holes to prevent the screws from being screwed in too deeply. This protects the cooling fins and channels underneath. The King is Dead, Long live the King. Those who were happy with the previous NexXxoS radiators will appreciate the many small improvements that the the NexXxoS V.2 radiators offer. Now one of the best radiators has been made even better. Your system deserves them.